Sony has finally made it official, they are entering the tablet business. This move has been anticipated for a while now so this may not be a big surprise. At first, Sony will release two tablets: Sony Tablet S and Sony Tablet P. Both will be running Google's Android "Honeycomb" operating system. Tablet S will be available for pre-order starting today and shipments should start late next month. 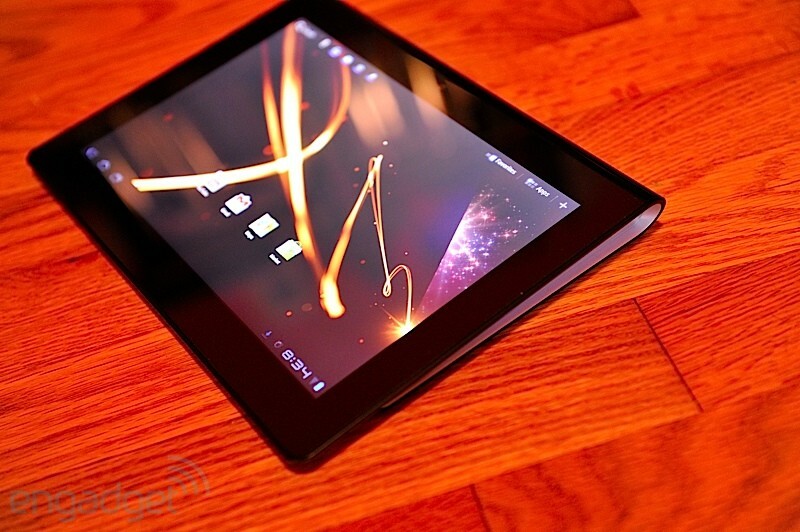 The availability of Tablet P is still open but Sony is stating later this year. Screen size 9.4" 2x 5.5"
Tablet S is pretty much a standard tablet and it doesn't look too different from the other Android tablets. However, Tablet P is something totally new. 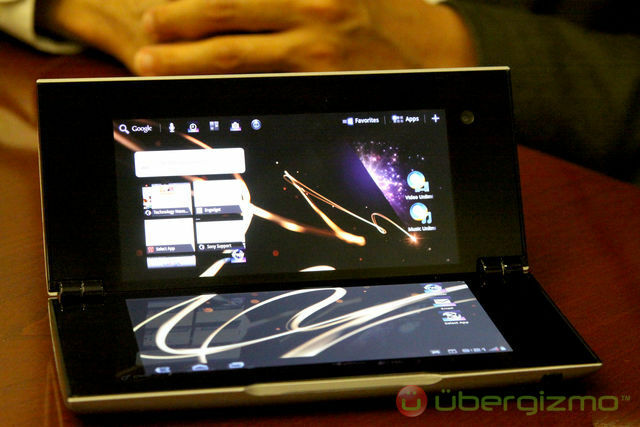 It consists of two 5.5" LCDs which can be folded. This is a bit similar to Nintendo 3DS. We have seen all kinds of different designs by now, such as ASUS Eee Pad Transformer and PadPhone, but Sony takes yet another new approach. The design allows one display to be used for example email and the other as a virtual keyboard. They can also operate as one big display. Tablet S is relying solely on WiFi. For some, this might be a bummer considering that most of the other tablets have at least an option for 3G. Maybe Sony is relying on WiFi hotspots or tethering. As for the Tablet P, it supports 4G and will be limited to AT&T. To make Tablet S a bit more than just one more Android tablet, Sony has added some exclusive content. Sony offers a service called Video and Music Unlimited. The former is a video store, pretty much like iTunes. Music Unlimited is a little more intriguing, it offers you a library of over 10 million songs which you can sync to your Sony Tablet (some other Android devices are also compatible). The service is subcription based so it appears that you can sync as many songs as you like without paying extra (similar to Spotify but hopefully with broader music coverage). Video Unlimited, on the other hand, charges for each movie. Every Sony Tablet comes with a six month trial of Music Unlimited and one free download from Video Unlimited. As Sony has always cared about gamers too, there will be some exclusive titles. For example Crash Bandicoot will be pre-installed on Tablet S. Sony claims that their tablets are the first Playstation Certified tablets so these titles may not be limited to just Sony's tablets (although it looks like they will be at first). As a whole, Sony's tablet announcement is positive. Sony has at least tried to be creative and come up with something new instead of just joining the already huge number of Android OEMs. Whether consumers will buy Sony's approach or not, remains to be seen. Yeah, but at least they are not way higher. Especially if you look at the likes of the Xoom and the HTC Jetstream (Which is laughably priced at $850 without 2yr contract, and it doesn't have WiFi). You should do some price checking...Xoom WiFi 32gig is available for $100 less than equivalent ipad. Xoom 32gig 3G is 499 with contract and $670.00 without. Apples 32gig is $729.00 with month to month service. There are less expensive options available for anyone who takes the time to look. The HTC is selling for $700 on contract or $850 without. Considering that Android tablets are rapidly rising in marketshare (iPad is at 60% now and was at 94% only few months ago), I would say all those tablets you are saying are not selling are magically disappearing. Exactly! Just as I stated, earlier today, concerning the HP tablets.....if you bring your product to market, and cannot compete with Apple in the apps area, then you can't compete with their price point. Every Apple fan seems to want to focus on the APP count. Who out there has over 1,000 APPS on his/her tablet? There is lots of junk available out there so APP count alone is a weak argument. Also, its only a matter if time till quality APPs are re-created for Android Market as the number of Android tablets owned by consumers is ever increasing.